Balcan Lighting Supplies Lincolnshire League leaders Sleaford Town Reserves will be looking for favours from the other end of the table as they compete for a place in the Challenge Cup final. They entertain Cleethorpes Town’s Development Squad at Eslaforde Park on Saturday in the last four of the competition. And they will be hoping that bottom two Ruston Sports and Market Rasen Town will be able to stop the chasing pack closing the gap on them at the summit of the league. 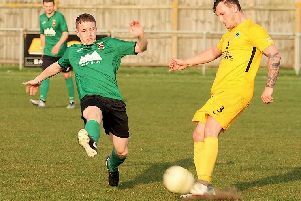 Rasen have a difficult trip to Wyberton, while Ruston Sports will be looking to prevent a fourth defeat at the hands of Skegness Town this season. Elsewhere Horncastle Town travel to CGB Humbertherm’s Fulstow ground, while Skegness United host Lincoln Railway AFC. In the Lincolnshire Junior Cup, holders Hykeham Town welcome Epworth Town to the Memorial Hall ground for their semi-final. Fixtures: CGB Humbertherm v Horncastle Town, Ruston Sports v Skegness Town, Skegness United v Lincoln Railway AFC, Wyberton v Market Rasen Town; Challenge Cup – Sleaford Town Reserves v Cleethorpes Town DS; Lincs FA Junior Cup – Hykeham Town v Epworth Town.